We had to wake up early, yet again. Our host Audrey had to be at work before 8am, and we didn't get to bed until past 1:30am, so (including yesterday night) we were definitely sleep-deprived. Audrey left me the key to deliver to her office. The sun was up and feeling beautifully warm. I drove us into downtown, looking for a Starbucks or something. No luck, but at least we got to see central Miami. We drove to Audrey's office to drop off her key; it was located in a warehousey-artistic district with lots of street art everywhere! I definitely liked it. 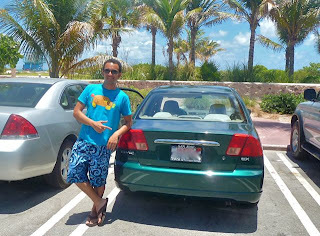 We then drove north along Biscayne Highway (US 1) to look for a Starbucks for some coffee and wifi. Yet again, we were without a host for the night, so we had to get some wireless internet in order to send some last-minute couchrequests. I had stopped by a different cafe and asked them for directions to the nearest Starbucks. Only when I was walking out did it feel awkward. So we stayed in Starbucks for a while; I sent out some requests, and we pondered whether to go to Pompano Beach (north of Fort Lauderdale) or whether to risk staying in Miami and finding a host here. We continued pondering as I drove the car to a nearby hand car wash to get all the road trip dirt washed off. They did a good job, and it was only $17! The car washers didn't speak much English though; which made me feel like I was back in LA - except that they were black, not Mexican. My impression of Miami so far is that it is a vibrant and cosmopolitan city. Yes, it's hot and tropical, but it's also at the intersection of so many cultures. Geographically, it may be at the southern tip of the southern US, but it's definitely not in The South. In fact, I'm struck by the fact that there have been hardly any redneck Southern types here. There are plenty of black people, all types of latinos, plenty of visiting Europeans (I overheard Swedish; and Ueli noticed that we sat next to some Swiss people! ), and many good looking, spoiled rich girls sitting around getting a tan in their bikini in the middle of the day. Ok, you can probably tell that we spent some time at the beach today. 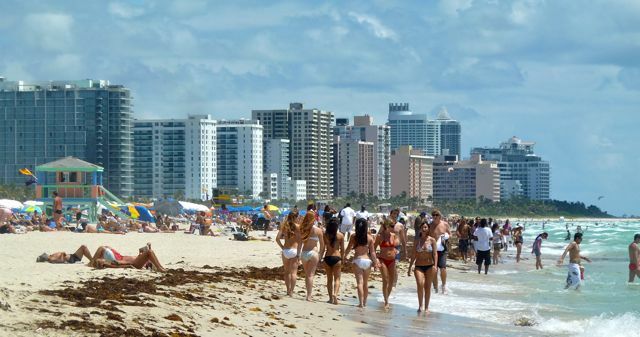 After getting the car washed, we finally decided to stay in Miami and go straight for Miami Beach, where we'd be dropping off the car anyway. So we visited South Beach for about an hour, and I symbolically completed this leg of my journey: I poured the bottle of water which I had filled up with the Pacific Ocean in Santa Monica into the ocean at South Beach. Anyway, what a beach! The sand was the perfect balance - not too rough, and not too powdery; it was coarse but soft, like freshly ground pepper. The air was warm but there was a steady breeze coming off the ocean. And the water! It was pleasantly warm and turquoise. Even the seaweed wasn't slimy or tough like in California; walking on this seaweed was like walking on salad. What an amazing place. It was the best beach I had ever been to. And the fact that it's right there next to the city - even better! So we walked back along Ocean Avenue, seeing some of the art deco architecture that South Beach is known for, and then we drove north to meet Noa and drop off the car. Along the way, I got a phone call from Benjamin, whom I had couchrequested a few hours before. He'd be able to host us! Score - our risk worked. WINNING. Anyway, Noa was still eating, so Ueli and I took another stroll along the beach, this time North Beach, which is full of high-rise condos. The beach was just as nice, although the water was oddly about 5 degrees cooler, which made it feel refreshingly pleasant. Noa dropped us off at a bus stop ("gotta get down to the bus stop" - damnit, it's Friday!). I left a lot of stuff in the back of her car, so I just grabbed my backpack which had all the stuff we needed. Instead of grabbing food nearby, we just took the bus straight for the Aventura Mall, where Ben would meet us after work. The only thing was, it was 2:30pm and he didn't get off work until 6. So we had an afternoon at the mall, just sitting around. We didn't want to drag our backpacks everywhere, so we sat and surfed the web. Which was fine with me - I had a lot to catch up on (and to blog about)! We stayed at the mall for several hours, checking email, etc., until Ben arrived around 6:30pm. He is relatively new to Miami, working here after living in Berlin and London (!) while he worked for the French embassy. He also was cool enough to drive us around and spend the weekend with us, since his prior plans fell through. This evening, we went out (around 9-10pm) looking for food, but everywhere we went was closed, so we ended up at a nearby coal-fired pizza place which made an amazing pizza but was not the cheap food that I was expecting. Still, delicious - but I think I was more tired than hungry. So back to the apartment, we kept it low-key and slept. No air conditioning, though, which meant that I was sweating throughout the night in my sleeping bag.